Bumble bees are big, fuzzy insects recognized by almost everyone by their robust shape and black and yellow coloration. The common species are 3/4 inch in length or more. 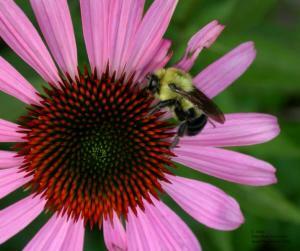 Like honey bees, bumble bees live in a colony where the adults care for the young (larvae) produced by a single queen. Bumble bee nests are small compared to honey bees, as each nest contains only a few hundred individuals. Also, unlike honey bees, a bumble bee nest is annual and is used only one year and then abandoned. Bumble bees may re-appear in the same area from one year to the next but they do not reuse an old nest. Bumble bee colonies are usually underground in a deserted mouse or bird nest though they are occasionally found within wall cavities or even in the clothes drier vent. Bumble bee nests in yards, flowers beds, wood piles, walls or other high traffic areas may create an unacceptable threat of being stung and justify treatment. Determine the exact location of the nest entrance from a safe distance during the day, but wait until night to treat if possible. Wear long-sleeved shirt and trousers and tie sleeves and pants legs shut or pull your socks out over your pant cuffs. Management of bumble bees Apply an insecticide dust labeled for outdoor use against bees through the entrance hole. Use a duster or squeeze bottle to puff the insecticide into the opening, or to "fling" the insecticide into the hole off an old plastic spoon. Cover underground nest openings with soil but do not plug nests in house walls until all activity has stopped. Be prepared to repeat the treatment if necessary. Repair wall nesting sites with caulk and paint.